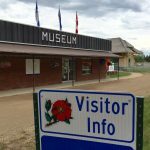 “How may we help you?” ask the friendly staff and volunteers as they greet area visitors and museum guests at our one-stop Visitor Information Centre and Kneehill Historical Museum, next to the Campground Recreation Park and across from the hospital on Hwy 583 (2 Street NE). Museum staff and volunteers work hard to collect up-to-date information to answer these and other questions about our resources, services, and heritage areas. We compile information from across the region. We ask local businesses to keep us apprised of new services in the area and we post their business cards. We keep a resources directory, annually prepared by experienced volunteers who know the area. For questions like “What is the oldest town building / Where was Turtle School / Ghost Pine’s Anglican Church / the Davis Stopping House / Keiver’s Lake / Pope Lease?” we can GPS the answer with history, provide a land location, give a copy of a map, sometimes one that shows who the neighbors were a hundred years ago. “When can I come to the Museum?” That’s an easy answer: May 15 to September 15, seven days a week, Monday to Saturday from 10 AM to 5:30 PM. We’re open Sundays from 1 to 5:30 PM with free admission for families. And don’t forget, every year the Museum hosts a free, day-long celebration of Pioneer Times featuring live demonstrations, including model trains around the museum grounds. 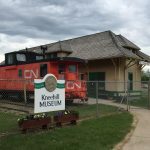 Train enthusiasts can climb into the CN caboose and go through the 1917 Station House. Agricultural aficionados can remember harvesting with the threshing machine using a grain wagon in the Agricultural Building. Children can sit in desks from the one-room school, wonder about pioneer life, maybe even talk on an old working hand-ringer telephone and puzzle with their parents on how early tools were used. Come yourself and bring visitors to experience the important artifacts that represented life for your neighbours in Kneehill County over the last century!